Many students at universities and TAFEs have free access to our service. If you're lucky enough to be one of those students (yay to you for choosing an AWESOME course provider, by the way) you will need to sign in via your student learning portal - you may know it as Blackboard, Canvas, Moodle, Connect, or a number of other names. Log into your student learning portal. If it's easier, you can find your portal here. Find the Studiosity link. For some students, it will be on your student portal homepage - but if not, you may have to click on individual course links to find it. Click on the link. You won't need to enter an email or password as your provider just passes that information to us so that we know you're eligible to use our service. 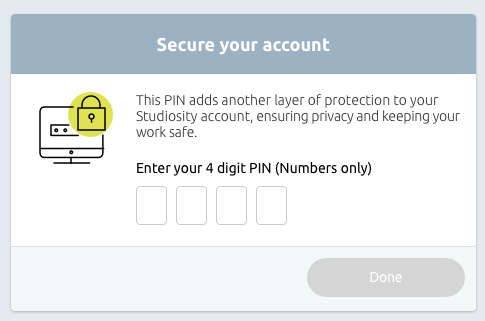 You'll just need to set yourself up with a 4-digit PIN to secure your account, so every time you access Studiosity after that, you enter your PIN to confirm your identity. Then, you'll be logged in directly into your account where you can get the help you need. If you have any trouble getting in, drop us a line so we can guide you through.